Detail from “The malignant disease,” illustration by Warren Rockwell for Channing Pollock’s “Stage Struck.” The whole illustration, along with three others by Rockwell, is included in the PDF for the selection. The theater bug. If you haven’t been afflicted personally, you almost certainly know somebody who has. Channing Pollock, in his various capacities as playwright, critic, press agent, and lecturer, had met hundreds of “plumbers, waitresses, floor-walkers and cloak-models” suffering from stage fever and struggling to make the lucky break that would lead to fame, accolades, and fortune. Pollock knew well the ups and downs of Broadway. He was sixteen when he became assistant drama critic at The Washington Post, and twenty-three when he was hired as press agent for the Shubert organization, “even though the Shuberts knew little more of drama and literature than cows know of the albuminous content of milk.” As a playwright, he enjoyed his greatest successes during the 1920s, chief among them The Fool (1922). But, his modern-day champion William Grange notes in a 1987 appreciation (see “Interesting Links”), Pollock was a believer in plays that speak to members of “church groups, P.T.A. luncheons, women’s clubs, and garden parties”—those who lived outside Manhattan—and he waged war against the “sophisticates” of the Algonquin Round Table and The New Yorker. It was inevitably an uneven match, his critics—led particularly by Dorothy Parker, Robert Benchley, and Brooks Atkinson—destroyed his career as a playwright with their persistently withering attacks. 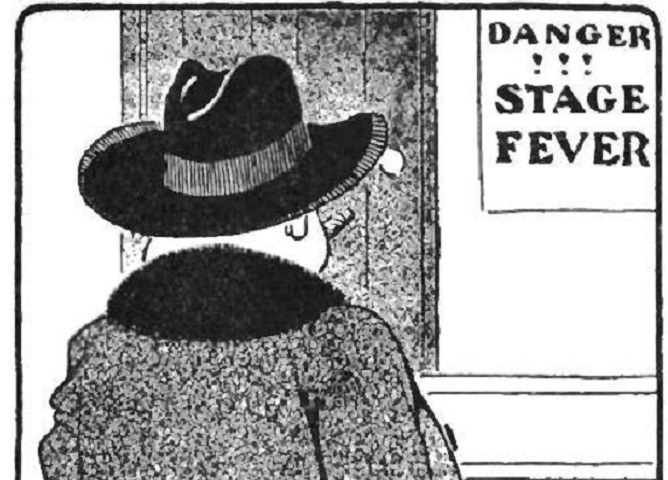 Pollock’s “diagnosis” of stage fever, written early in his career and reproduced here with the original illustrations by Warren Rockwell, describes the stories of some of the wannabe actors and actresses he and his colleagues met outside the theater or on the road. He takes a scornful, mocking view of the talentless, stage-struck members of community theater groups and acting programs, from telephone operators to society women, from naval officers to silk importers—many of whom probably made up the very audience for his later plays. “From the stern life of an officer in Uncle Sam’s Navy to a merry job carrying a spear in the chorus of a musical comedy may be a far cry”, but that is the step which a metropolitan newspaper recently recorded as having been taken by a young man named in the story whose beginning is quoted above. . . . If you don't see the full story below, click here (PDF) or click here (Google Docs) to read it—free! Endless anecdotal advice NOT to try to be an actor.